Experimenting, applying the quantum physics laws to psychology, we assume that the Gaia's environment & human behaviour patterns carry within the law of polarization of atoms, the positive attracts negative and vise-versa. 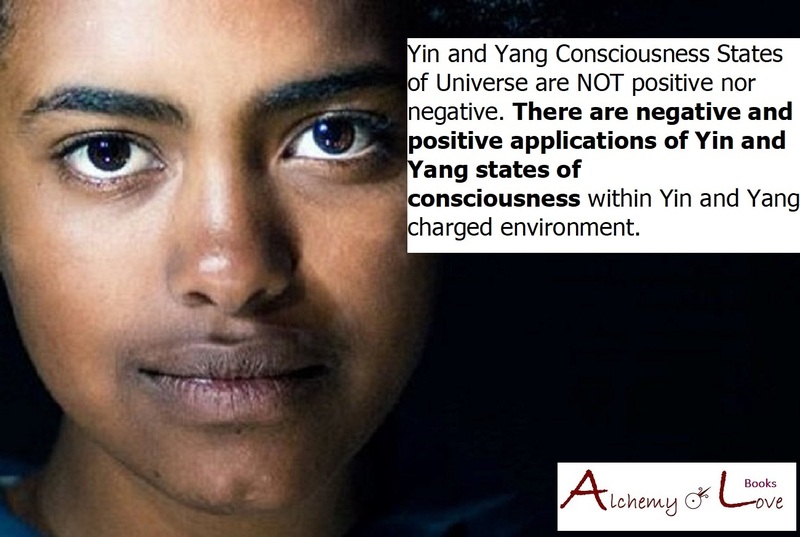 Building a highly positive charge with no Yin manifestations of Consciousness, creates reverse effects. Within China this state of Being resulted in a strong build-up of many superstitions. Feng Shui was a science of determining where to bury the dead ancestors so the good luck will follow the descendants. Priests, who were carriers of “Divine Wisdom” got so corrupted, competing for more money, giving the opposie advises, caused that people in their confusion stopped burring their dead, keeping them rotting in the back-yards, spreading disease until Government introduced measures to stop the ignorant from their stupidity. Businessmen and “good men” at work stopped acting when the days were not “beneficial”, causing the country’s collapse during the non-auspicious days. Recently, during the 20th cenury, within all that commotion Religion was banned. the hemophrodite Universe of each country changes at all times, breathing, constantly evolving while Humanity’s thoughts evolve. While cooking we learned that a saucepan is easiest to clean when we have just cooked or when it is new. If the pot is already burnt, one needs to soak it for hours. Most of us are aware that within the mental and emotional sphere humanity follows the same pattern. We get warried seeing our kids aggressive fearing aggression in their adulthood. We get warried seeing our countries deteriorate with ignorant men or women. None of us wishes our kids to grow within a disturbed environment. None wishes to see kids lazy, attached to technology or lying, yet we see our little ones surrounded by modern Influencers endlesly shaping our Minds. In our ignorance, while setting a family, we believe that Kids fall from trees “perfect”. The amount of work necessary to shape them into conscious human beings is HUGE! These days, parents aim for much more than a “survival”, they fight for their kids’ emotional, mental and physical betterment aiming for the highest. Parenting kids, we are at all times challenged within this matrics of Yin / Yang forces. For example, a father with more Yang forces might act over-aggressively when faced with strong negative applications of Yin or Yang within his kids. Accepting this fact, men more-or-less left the early stage parenting in the hands of women keeping the task of a Knight safeguarding the environment, making the day-to-day decisions for the benefit of the family. Both kids and animals respect the balance of Yin / Yang forces within each one of us. When taking care of a baby Labrador while my friend, the owner, was abroad I was amazed by the freezing instinct this dog had when meeting any baby human. A 1 year old baby approached, surprising us all, putting her hands directly into the dog’s jaw, before any of us grown-ups could react, yet the 6 weeks old baby Labrador did nothing to harm the baby staying super careful within their encounter. Needless to say that the Labrador was not yet trained. The story might have had a different ending with a wolf, yet I had many peaceful and loving encounters with wolves when I knew they have already eaten. In our house-hold my cat (that is always free to go wherever she wants) did eat our bird (always flying wherever she wanted), only because my kids unconsciously allowed the cat into the house before they fed her. A naturally Yin girl with her imbedded aversion towards mathematics may make the father furious. If her mum has mastered this aspect of her-being (has developed the positive aspect of Yang – logic) she might become even worse in her “war” against her daughter’s natural aversion. Important learnings from Yin and Yang balance of Nature is that using a force, the girl will just go into a further revolt. Remembering our not such a distant past, mathematics were reserved for the boys while the girls’ schools kept their learnings within the area of music, cooking, languages, sawing, etc. A girl was drawing at all times. A music teacher told her to stop drawing during her class. The girl responded – “but this is my passion!” This intuitive logic resonated perfectly with the Yin nature of the teacher who also had to struggle to materialize her passion within her life. Within the Yin states of Consciousness “slowing-down” is our Guard from all sort of abuse (during the time of slavery) or over-work when cultivating the land or working within a service or product oriented businesses. Subconsciously remembering the horrors of the English Industrial Age, slave-drivers, or using kids as labor, when the working day had 16 to 18 hours. In a natural environment, fishing or cultivating land, men slow-down in winter waiting for the land to rest, women slow down when they have kids, old people slow-down when sick. So nature takes care of our natural cycles. Within the Yin and Yang states of Consciousness there are positive and negative applications of both slowing-down and laziness. Within the “Logic” dominated society, one can become accustomed to ignoring the signals from the body. We may be slowing—down because we intuitively feel a sickness coming our way. How many times have you taken your holiday and collapsed? Within Yang states of Consciousness, a male who is a Manager collapses as soon as on Holiday. The “Yang” based minds have more difficulty to sense their “intuitive” mechanism sending signs to “slow-down”. While exploring the negative manifestations of Yin state of Consciousness, we all know that the land that is not attended to will not give fruits, that a house that is not maintained will collapse under elements, that a child that is abused will not have an inspiring adulthood, that if our garbage is not-collected we will experience the spread of diseases. Our “logical” part is affraid of this “chaos”! A woman more intuitively feels the need for “slowing-down” and she can direct the man within this cycle. This is why when Yin meets Yang in Harmony, Balance follows their lives. When they have kids this Balance is disturbed both when in a negatively charged environment, or with the inflow of a strong Yang (a boy) or a strong Yin (a girl) manifestation of unconscious behavior of Humankind.